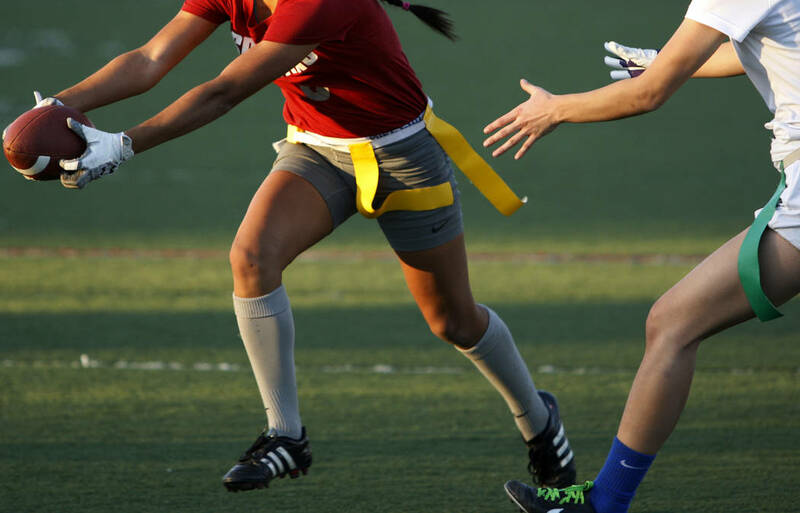 Kallie Graves ran for two touchdowns and threw a pair of scoring passes to Madison Cheney on Tuesday as the Virgin Valley flag football team wrapped up the Sunrise League title with a 34-7 win over host Tech. Graves completed 16 of 20 passes for 258 yards, including TD strikes of 30 and 11 yards to Cheney. Graves also rushed for 25 yards and the two scores on six carries. Cheney finished with eight receptions for 112 yards. Katie Zuniga added a rushing touchdown for Virgin Valley. Taylor Ritayik rushed for 103 yards and a touchdown on 14 carries for Tech. Bonanza 38, Durango 28 — At Bonanza, Cindylou Rasiang threw five touchdown passes to lead the Bengals over the Trailblazers. Rasiang completed 15 of 23 passes for 250 yards. Ashley Vasquez had eight catches for 143 yards and three touchdowns, and Alexis Marquez and Evalynn Sandoval each had a touchdown reception for the Bengals. Charlene Beck had 10 carries for 110 yards and a touchdown, and Destiny Bradford had nine tackles and two interceptions for Bonanza. Kiarra Castro added nine tackles and two sacks for the Bengals. Durango’s Jaden Brown had 18 carries for 141 yards and a touchdown. Gabriela Corchado added four catches for 92 yards and a score for the Trailblazers. Sierra Vista 40, Clark 32 — At Clark, Aaliyah Medina completed 18 for 35 passes for 220 yards and four touchdowns to power the Mountain Lions to victory over the Chargers. Jamie Kalaau-Sunia hauled in two TD catches, and teammates Courtney O’Neal and Briana Miller each supplied a TD reception for Sierra Vista, which led 27-12 at the half. Jagayra Gomes had three rushing touchdowns and threw a touchdown pass to lead Clark. Gomes rushed for 177 yards on 11 carries. Del Sol 19, Chaparral 6 — At Del Sol, Stephanie Tewart tossed a 21-yard TD pass to Janeth Varela, and Valerie Perez rushed for 95 yards on 17 carries as the Dragons downed the Cowboys. Saleena Quichocho caught three passes for 55 yards and had 13 tackles, and Leila Canete had two interceptions for Del Sol, which led 12-6 at halftime. Desert Oasis 40, Spring Valley 27 — At Desert Oasis, Georgia Sykes caught seven passes for 166 yards and three touchdowns to lead the Diamondbacks past the Grizzlies. Calei Cunningham had 13 tackles and a sack and completed all three of her pass attempts for 53 yards and a touchdown for Desert Oasis. Izriah Hodson rushed for 76 yards and a touchdown, and Ruby Martinez caught a TD pass for the Diamondbacks. Makayla Rickard completed 13 of 23 passes for 232 yards and three TDs for Desert Oasis. Boulder City 18, Moapa Valley 12 — At Boulder City, the Eagles picked off seven passes and topped the Pirates. Ryann Reese had four interceptions for Boulder City. Nikki Meleo returned an interception 54 yards for a touchdown, and Kamry Bailey and Hannah Barth each added an interception for the Eagles. Meleo had eight tackles and rushed for 85 yards and a touchdown on 11 carries. Alexandria Peay threw two touchdown passes for Moapa Valley. Valley 20, Eldorado 0 — At Valley, Frida Ochoa-Uribe and Dominique Diaz each had a rushing touchdown to help the Vikings beat the Sundevils. Heather Robinson caught a touchdown pass from Summer Gibson for Valley, which scored all three TDs in the first half.